Hey everyone! 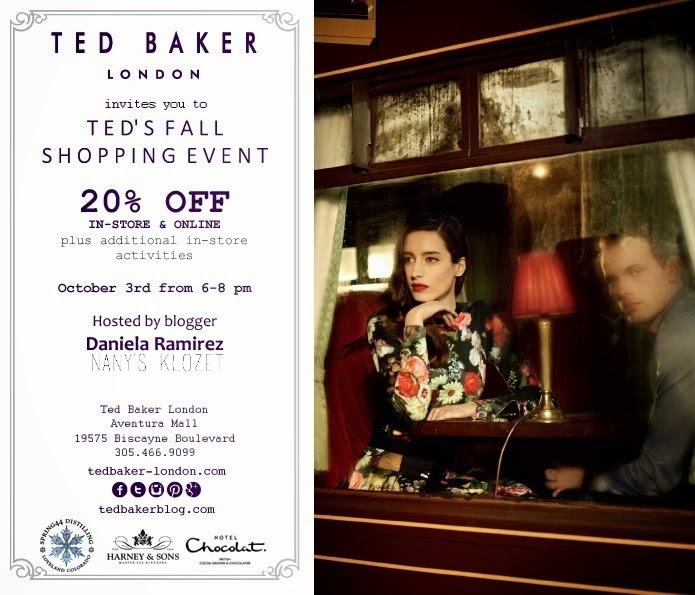 I just wanted to quickly invite you to an event I'm hosting with TED BAKER this thursday October 3rd from 6 to 8pm at Aventura Mall. If you live in Miami or South Florida, I'd love to see you there and say hi to you in person. Also, there will be 20% off in-store and ONLINE (so you can take advantage of the discount anywhere). Either way, don't forget to RSVP here. Also, I'll be uploading pics on Instagram, so don't forget to follow me there @nanysklozet and @ted_baker. See you there!! And stay tuned because I'll be doing a giveaway with Ted Baker soon!! ¡Hola a todas!! Hoy quiero aprovechar esta oportunidad para invitarlas a un evento con TED BAKER el jueves 3 de Octubre de 6 a 8pm en Aventura Mall. Si vives en Miami/Sur de Florida me encantaría que pasaras un ratito a saludarme- aparte que va a haber un 20% de descuento en la tienda. Y si no vives en Miami, todavía puedes disfrutar del 20% de descuento online. Así vayas al evento u online, no olvides confirmar tu asistencia por acá. También voy a estar subiendo fotitos en las redes sociales, así que no olvides seguirme en Instagram como @nanysklozet y @ted_baker. ¡Un abrazo!¡Las veo ahí! Y pendientes que pronto haré una rifa con Ted Baker por acá.